The HX50 blends some high-spec features in among more standard travel zoom fare. We like the versatility of the 24-720mm equivalent optical zoom lens, but the maximum aperture range lacks that high-end feel - something which the hotshoe and exposure compensation dial both seem to suggest otherwise. Which leaves the HX50 sat on the fence: it's got stacks of features and plenty right, but the image quality and level of creative control doesn't elevate the HX50 out of its category to its fullest potential. Bigger zooms, smaller bodies: the compact camera market continues to evolve and Sony thinks it has the winning travel zoom formula in the shape of the Cyber-shot HX50. With a 30x optical zoom crammed into a relatively compact body, the HX50 is like a condensed superzoom camera. Does that make for the ideal compact - that dream camera that the masses will latch onto - or is its wide-ranging zoom lens and high-resolution 20.4-megapixel sensor combination simply trying to achieve too much within their given confines? The HX50 is just shy of 4cm deep which is an achievement to behold considering the 24-720mm equivalent focal length the 30x optical zoom lens offers. A couple of years back superzoom cameras three times the size offered up a similar feature set. Yet at the same time it's that lens which makes the HX50 larger than many competitors' compacts. That might sound obvious, but the 30x zoom is the driving force in the HX50 and if it's zoom you want then you'll have to pay for that with a slightly chunky body. If not there are alternatives such as the Panasonic TZ40. There are two approaches to looking at the HX50's lens: point-and-shoot snappers who're all about getting in on the action will find the vast zoom a delight but may encounter low-light limitations; whereas more advanced photographers may be left scratching their chins as to whether the limited maximum aperture range and optical quality compromise are the correct fit for their needs. To expand on that second viewpoint slightly more: zoom is one thing, but maximum aperture and optical stabilisation are two other key factors to consider. As the HX50 is small its maximum aperture range of f/3.5-6.3 - i.e. at 24mm f/3.5 is the maximum, dipping by the value of one and a two thirds to f/6.3 at the 720mm equivalent - is fairly restrictive and there's not the bright aperture setting of more advanced compact cameras at the wide-angle setting. We can cry, we can moan, but this is typical of a compact camera of this stature. If your mind boggles at the presence of such numbers then don't worry - the HX50 has all the automated point-and-shoot modes that you could ever need where the camera will take control. However if conditions are dim and the zoom is extended then that number means less light can enter the camera and, therefore, low-light conditions can make it tougher to snap a sharp shot, while the camera will be forced to push the ISO sensitivity up which results in diminished image quality. That's the long and short of it. On the optical image stabilisation front the HX50 puts a tick in the box with a fat-tipped-Crayola pen. Optical stabilisation - which Sony calls Optical SteadyShot - moves the lens elements by microscopic amounts to counteract handshake in real time. As this is dealt with at the lens level it assists in keeping the preview shot on the rear screen steady - an essential at longer focal lengths - but also helps maintain optimum sharpness in the final shot. Sony's OIS is a sterling performer and an essential feature in the HX50. Sony's stance with the HX50 leans towards the high-end, despite a design that's otherwise more typical of a standard compact such as the earlier HX20V model. The HX50's inclusion of a physical exposure compensation dial and a multi-function hotshoe are the two most stand-out features, but do these sensibly fit into the bigger picture of who the camera is aimed at? There's no raw file capture, for example, and while the provision to add a viewfinder will be welcomed by some it'll add a further £279-379 to the already sizeable £330 price tag, throwing the HX50's asking price to well beyond that of even the HX300 superzoom. Better to have the hotshoe than not, but whether that'll connect to the HX50's target user base is another matter. The HX50's zoom is controlled via a standard zoom toggle around the shutter button, which works fine but doesn't add the finesse of a lens control ring, a la the Panasonic Lumix LF1 or something like the Olympus X-Z2, or step zoom control and the like. There is a single Custom button which provides access to a single programmable function, although only ISO, white balance and metering modes can be controlled via here. We've been using the HX50 for a number of weeks in a variety of conditions and have found its rear screen to hold up well. Bright sunlight can be a problem due to reflections, but that's a given with the majority of compacts and if it's a real concern then there is the hotshoe accessory for an accessory viewfinder. Otherwise the rear LCD screen has a decent viewing angle and the 3-inch size and 921k-dot resolution up to scratch - there's not the more advanced touchscreen control or tilt-angle mechanism, but we suspect that both would inflate the price and the latter would begin to bulk the HX50 out to Canon G15 proportions. Elsewhere autofocus does a good job of zipping into focus with ease. When light is good the camera specifies the focus area with a confirmatory green rectangle, although in low light a large dotted rectangle covers the majority of the screen which lacks the pinpoint accuracy we'd like. 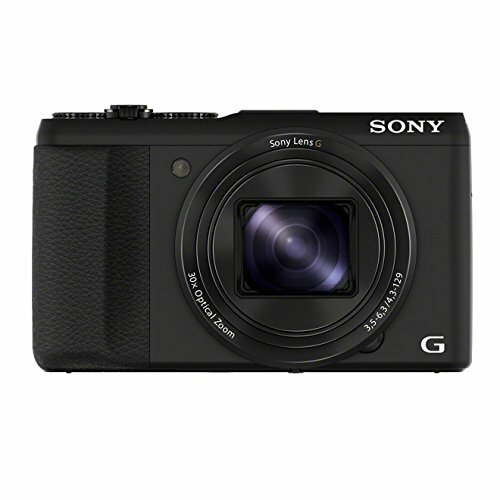 This is typical of current Sony compact cameras. From the Multi AF, Center AF and Flexible Spot AF we opted for the user-controlled flexible option. A press of the d-pad's centre button opens up the focus point for repositioning through the majority of the screen, save for the outermost edges. That same d-pad button also toggles between other key settings - ISO, aperture and shutter, depending on the shooting mode selected - which, while useful for their adjustment, can become a nuisance as extra key presses are battled with to get back to the focus point adjustment. Manual focus is also possible where the rear d-pad is used to adjust the focus distance. However the lack of a focus-distance measure, and a display bar that merely shows a cursor between a head-and-shoulders icon and a mountain icon isn't as detailed as it ought to be - again it's that mix of high-end meets consumer that's not pulled off to its fullest potential. From our extensive use of the HX50 there's one aspect of its feature set that can be considered a resounding success: the battery life. The NP-BX1li-ion battery is the same as found in the Sony RX100, and in the HX50 it delivers a performance that plenty of other compact camera manufacturers would do well to take note of. Then there's the obligatory Wi-Fi that any modern-day compact worth its asking price adds to the feature set. Outside of Samsung we've not been too fond of Wi-Fi implementation in most cameras, but the Sony smart device control - accessible after downloading the free Play Memories mobile app - does a good job. Setup is minimal, the app auto-detects the camera and from there it's a matter of seconds - and one password - to use phone or tablet as a remote viewfinder and fire off shots which are the automatically pushed to from camera to device. Sharing within the app is also wide open to the likes of Facebook, Twitter, Picasa and so forth - not locked down like some competitors' versions which attempt to push use of individual manufacturers' services. It's not perfect as there are very few controls all in all, but it's a darn good bash at the Wi-Fi workings. No sign of NFC (near field communication) though, which feels more of an oddity given Sony's commitment to the technology in its Xperia range and beyond. The crux of what a camera is about in the end is just how good its resulting images are. And in the case of the HX50 it's a bit of a mixed bag. Or, at least, it is dependent on expectations. As we keep coming back to, those after a point and shoot with a big zoom will likely be happy with what the HX50 produces, whereas those lured in by the higher-spec features will find the 20.4-megapixel sensor - the same one as found in the Sony HX300 - to disappoint when it comes to the fine details. All that resolution on a small sensor size was always going to have its limits. Pair that up with a lens that, despite its impressively small size, offers less impressive optical performance and the demanding user will need to be aware of the compromises. Small and pocketable comes at a cost. The ISO 80-3200 standard range - which expands to ISO 12,800 in the multi-shot superior auto mode - maintains quality from ISO 80-400 with few qualms. The problem is that even at the base ISO sensitivity there's a presence of image processing artefacts in the detail areas. Viewed on this review page at this scale and you won't notice, indeed this well-exposed shot of a gull in Brighton has its own glow - it's all apparent detail and subtle white balance that delivers plenty at this scale. Not so at 100 per cent scale. Throughout the range shots are riddled with processing artefacts, while subject edges are often smeary as a result of the wide-ranging lens. Other lens issues come in the form of chromatic aberrations - those (in this instance) purple fringes that lapse over subject edges - which become more prominent towards the edges of an image as the focal length increases. Just like the HX300, the HX50 does do a good job of squeezing out the image noise throughout much of the ISO range, particularly the higher ISO settings where even an ISO 3200 maintains enough colour to be passable. In-camera settings from sharpness, colour saturation and noise reduction do offer added control, but as they can only be set prior to shooting they make the absence of raw file capture all the more prominent. The HX50's shots aren't bad by any means. For day to day snaps they deliver aplenty, but those with higher expectations - or who happen to think of the HX50 for a higher-end compact than it truly is - may find the results to disappoint. It's all about matching expectation to results - but we do think Sony should follow Canon and start to slide back down the resolution scale to a more comfortable megapixel count where the likelihood of heightened quality is increased. The HX50 has a packed-out specification will undoubtedly attract plenty of potential purchasers. But does it deliver in every department? Not quite. For all its strengths - and there are plenty to name - the HX50 feels a little on the fence, sandwiched between the high-end and the not so much. The wide-ranging zoom opens up plenty of shooting potential and has a great optical image stabilisation system, but the limited maximum aperture settings lack that full creative control. Usually that wouldn't be a fair criticism for any camera in this travel zoom category, but the HX50's inclusion of a multi-interface hotshoe seemingly holds up a flag of high-end expectation - high-end which, while successful in some areas, otherwise lacks throughout. A decent screen, responsive autofocus, physical exposure compensation dial, sturdy build quality, Wi-Fi integration that works without the faff and an excellent battery life build up the HX50's favour. But it's in the image quality department where - and just like the Sony HX300 superzoom - the camera falls just short of the mark. There's just not the crisp finery when viewing shots at full scale as a result of the high-resolution 20.4-megapixel sensor and raw capture lacks. The £330 price tag may not be small, but then neither is the HX50's feature set. There's plenty of success in this camera that's unlike anything else currently on the market, but one or two shortfalls hold it back from full potential.